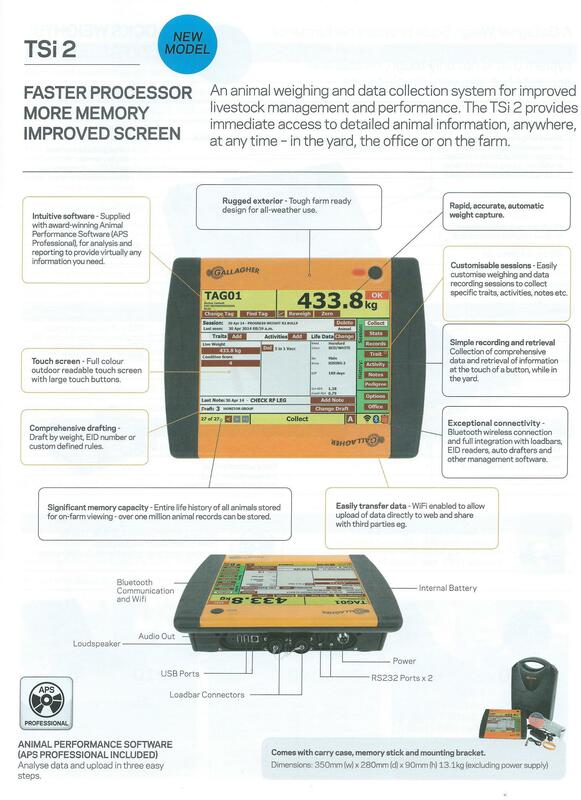 New and improved - The Smart TSi Livestock Manager from Gallagher. 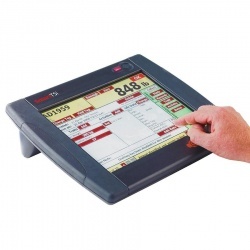 The TSi is an integrated animal weighing, data collection, computer animal management system that is specifically designed for life on the farm. It has an all-weather exterior and intuitive, simple to use touch-screen technology. Farmers can get immediate access to their livestock management information anywhere, at any time. It also comes loaded with sophisticated yet easy to understand Animal Performance™ Systems Software (APS Professional) for data analysis and reporting. The TSi can help you improve livestock management and performance! The TSi allows you to instantly record and access data on individual animals and groups of animals, enabling you to make critical assessments on your livestock performance and strategic farm management decisions - in the office, in the yard or elsewhere on the farm. Integrated weigh scale, computer and animal management system in one, enabling improved livestock management and performance. Provides immediate access to detailed animal information, anywhere, at anytime – in the yard or office, anywhere on the farm. Touch Screen, full colour and readable outside. Tough design for outdoor use. Award-winning Animal Performance Systems Software (APS professional). APS Professional is intuitive, simple to use and touch operated for rapid recording and retrieval of information on individual animals, or groups of animals. APS Professional allows comprehensive analysis and reporting of animal information collected previously in yards or on farm, and can be used on both the TSi and Windows PC. Easily customise weighing and data recording sessions to automatically collect specific animal ID, traits, activities, notes and life data. Record observations or future actions required for specific animals, such as withholding periods and unlimited notes per animal. Retrieval of notes and other information at the touch of a button, while in the yard. Comprehensive drafting capability. Draft by weight, EID number or any other user-defined rule. Bluetooth wireless connection for EID tag readers and drafters. Nathanael McGhee, Cattle Breeder - Beaudesert, Queensland, Australia. If you have any questions, please don't hesitate to call. We are a family run business and we are always happy to help. We also have the full support team at Gallagher who are happy to offer after sale support and assistance as you learn to use your new system.